At some point in your lifetime, you’ll likely be faced with the prospect of selling your home. You might need more space for a growing family, a house that can accommodate parents who will be living with you as they age, or a smaller home now that the kids have graduated college and moved away. Regardless of the reason, it’s wise to be a savvy seller. The more you know about the selling process, the less chance for unwelcome surprises and stress, and the better equipped you’ll be to deal with hiccups in the selling process. You might wonder if you should bother getting a home inspection, since the buyer will likely have one done anyway. The answer is yes and here’s why. A home inspection reveals the true condition your home and helps you avoid costly surprises after you’re well into the process of selling. An inspection can reveal any significant issues that may have gone unnoticed, so you can repair them in advance. This eliminates a potential negotiating point and eliminates any delays that could have resulted from completing the repair. You might be tempted to try and save on agent fees by selling your house yourself, but did you know studies show for sale by owner transactions result in less profit than agent-represented sales? Not only do our licensed real estate agents at Oak City Properties have a much stronger marketing machine in place to appropriately advertise your home, but they also have a network of fellow industry professionals and in-depth knowledge of industry trends, real estate law, negotiating expertise, and more. Pricing your home properly is the most difficult but important aspect of listing your home for sale. You don’t want to set the price too high so it sits on the market without interest, nor do you want to set it too low, missing out on realized profit. An agent can help you by looking at the age and condition of the home, neighborhood desirability, and recent comparable sales. Other things to consider are your motivation level for selling and the profit you may need to realize. It may seem cliche, but if you want to secure high-priced offers on your home, you’ll have a better chance of doing that if your house is visually appealing. Potential buyers, raised on HGTV, want clean, charming, updated homes. That means decluttering and moving excess furniture into storage so your rooms look bigger and more functional. It also means cleaning the house from top to bottom, opening blinds to show off attractive outside views, ensuring you have good curb appeal, and even replacing light bulbs so the house seems bright and light rather than dim and depressing. How much should I upgrade to make the house sellable? It certainly makes sense to create a punch list to complete minor repairs that have sat unfinished. And that pre-inspection we mentioned above will guide you to repairs that are an absolute necessity. Consider a fresh coat of neutral paint, replace old, outdated fixtures, and repair carpet / flooring that may be damaged. Outside of that, don’t make major cosmetic upgrades, like kitchen or bathroom remodels. You won’t get your money back, and you won’t get to enjoy them yourself. If you’ll be buying another home in the area, it’s tough to decide how to manage this process. Many times sellers get excited about the prospect of a new home, tempting them to put an offer on another house while their old home is still on the market. But this is a risky proposition that could result in carrying two mortgages for a while, not to mention the headache of selling one home, while going through the whole buying / underwriting process for another. And what if you have a solid buyer but the sale falls through at the last minute? Evaluate whether you can comfortably carry two mortgages at once, and whether you have the personality that thrives on stress, and plan accordingly. 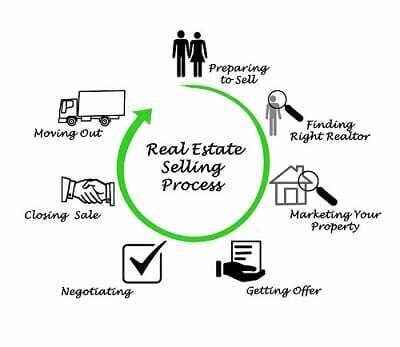 When you’re ready to sell your home, contact us first to learn how our expertise in the Raleigh market and team of real estate professionals can make the process more successful for you. We can help you work through the many considerations involved in putting your house on the market, and we bring extensive knowledge of the real estate environment to the table.